One more post about peanut butter cookies…..just one more. I know two people, Erin (no recipe on that link) and Nicole, who have already made the cookies using a scratch dough. Erin used scratch dough to save $$$. Nicole used scratch dough because she didn’t have time to find the refrigerated dough. I decided to make half a batch of each. I took them to the school teachers’ loung to get some reviews, but no one was around so I left them there and went to Target for some retail therapy. So the reviews are from me only. Million Dollar Cookies Darker and chewier as opposed to light and crumbly. They had more of a brown sugar taste, chewier edges and as the usual packaged cookie dough flavorings. Some people might actually prefer this texture over scratch. I’m just sayin’…. Nicole’s scratch cookies had a good homemade taste. The texture was light and flakey and cookies set up beautifully. I kind of like the scratch because I’m used to it and know it’s scratch. Both were good. In the end, I think the idea of stuffing peanut butter into peanut butter cookies deserves recognition. After making all these stuffed peanut butter cookies, I think I’m going to be disappointed with non-stuffed peanut butter cookies. Here are a few notes and recommendations. And then I will stop. 1. Use salted peanuts — more drama! 2. More peanut butter in the filling ( 2/3 to 3/4 cup). The filling balls will be stickier and harder to work with, but the results are worth it. Wetting hands a bit helps with the shaping. 3. Don’t flatten too much or you won’t get as much contrast. Yum! I just made these today and they are good. I did flatten them too much so there wasn’t as much contrast. My daughter saw me rolling up the balls and she had the idea to put a chocolate chip inside the peanut butter ball. Maybe we’ll try that next time. I bought 2 Pillbury Peanut Butter rolls so I’ll be making them again for sure. Anna, thanks for the book recommendation. I reserved it at my library and will be picking it up this weekend. Both look awesome to me! I enjoyed the ones made according to the Bake-off recipe but I’m looking forward to trying some made from scratch. Ok! I made my version with honey roasted peanuts! I just saw the Pillsbury cookie dough at Walmart this morning for $2.06, if anyone is really looking to save some change. I live in Kansas and prices may vary, but that may be your cheapest place to find them. 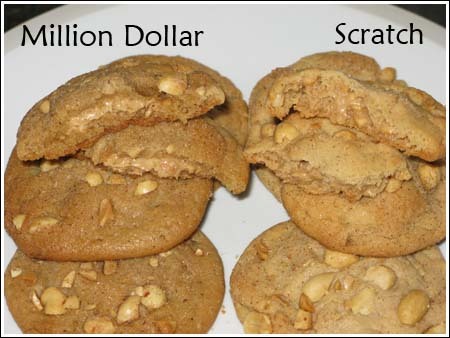 I’m going to try the DD PB cookie today with homemade dough (from Baking Bites) and using Peanut Butter & Co. Dark Chocolate Dreams/PB Mix for the middle. Sounds yum to me. I’d have to say homemade all the way on any cookie anytime, but you’re definitely right about the convenience of buying the dough now and then. WOW! You have read my mind in trying a homemade version of the winning pillsbury recipe! My mom-n-law was over for a visit last nite. She ***abhors*** anything that is from a box mix, tube cookies…etc. HOMEMADE…always is the better choice in her opinion. Sometimes though…a box mix just works…ya know???!! First, the convenience! I have over the years though understand what she is saying. I have truly come around the bend and appreciate homemade over box anytime! What is it…the preservative taste?? I don’t know. I will definetely have to try this recipe out! YOU ROCK!!!! Thank you so much for trying the homemade version vs. the tube cookie dough recipe experiment. You are the winner again in my opinion! This is directed at Heartofglass21 above. Cook’s Country magazine redid the tunnel of fudge cake( from scratch) and its fabulous!! Btw, the price of those refridgerated doughs have really jumped in price. It was on sale for 3.29 when I used to pay 2.50 on sale. anna, this is awesome work, you are the greatest. It’s great to see how many people like the winning idea and are anxious to try the scratch version. It seems as if peanut butter is having a resurgence in popularity. Maybe it goes along with the renewed interest in comfort food that’s arisen during these uncertain times? I’m not really sure. As for the people who don’t like the winner, well, that’s just the way it goes. I had flack, the pie that won the year before received a fair share of criticism and I’m guessing previous winners did too. It’s a lot of money for a recipe and is *any* recipe really worth that much? It’s a combination of skill, luck, and trying to figure out what will capture the attention and tastebuds of judges on any given year. After that, it’s how well you execute your idea on cook-off day. The thing is, anyone can try. They don’t ask for an entry fee, there’s no limit to how many recipes one can submit and they don’t ask that you do anything complicated. Hopefully,companies will continue to have more cooking contests. I’m not really sure what’s in store for the future. Marie, or anyone interested in contests, I recommend Amy Sutherland’s book “Cook-off. Recipe Fever in America”. Thanks for posting the links to the scratch recipes. I can’t find the pre-made cookie dough in my area for some reason. I love peanut butter, so these are definitely on my list to try. I have to say that I don’t get all the hate directed at the winner. Simple recipes are what the Bake-Off is all about IMO. Anna, were people generally happy for you or were there a lot of sour grapes, if you don’t mind my asking? I’m a bit fascinated by the cooking competition world. Some people have also complained about the appearance, but I bet with a few colored sprinkles or a peanut segment flower it would look quite festive! Katrina, I am enjoying your blog! Keep the photos coming. Sharon, Nicole and Erin. I liked homemade the best, but I can’t say it *is* the best. I think if you took them to a party, **normal** people would just be impressed with the filling. Jane, I’m glad you appreciate the scratch version and thanks for replying to Sylvie. I like both types of peanut butter, but I tend to bake more often with Jif. Emiline, I love the honey roasted peanut idea! Speaking of other types of versions (specifically chocolate stuffing). You could wrap the dough around something like a chocolate kiss, but that’s been done to death. I like the ganache idea. I have a recipe where I stuff a chocolate truffle cookie in the center of a snickerdoodle. You could stuff the same truffle dough into Nicole’s peanut butter cookie dough. BTW. I’ve tried wrapping cookie dough around creamy Lindt truffles. It sort of works, but not really. The truffles leak and make a mess so I don’t recommend it. The from scratch looks good. I will try it with almond butter. BTW, I am intrigued with your attempt to duplicate Almondina. Would you mind sharing the recipe? I would love to try it. As always, I really enjoyed your blog. Thanks for doing all the reviewings and testing for us! I had already thought of doing something chocolate in the middle and am going to play around with that. I have some of the dark chocolate/peanut butter and I might also try some other chocolate middles. Sounds good to me. You read my mind. I was wondering how these would taste made from scratch! Glad to see that you posted results. I imagine we’ll be seeing all kinds of versions of these cookies in days to come too! Thank you for posting Nicole’s recipe! I thought the original cookies looked fantastic, but I am a snob and I only bake from scratch! Can’t wait to try these! You and Nic have me really inspired to bake these cookies. I think peanut butter filled cookies sounds delicious. The peanut butter dough was on sale today. I picked it up, looked at the ingredients and put it back. I might play around with the recipe tonight. I have honey roasted peanuts. That should be fun! Has anyone tried making these with a chocolate filling? I bet you could fill the cookies with little balls of frozen chocolate ganache before baking them. That might be a nice surprise! Has anyone tried using natural peanut butter? I would assume it would not be the same consistency in the middle, but I would feel much better about eating (the whole batch myself!) if I could avoid the hydrogenated oil of JIF. Thanks for giving both versions a taste test. I’ll do the same just as soon as my market has a 2 for $5 on the cookie dough. I took the homemade cookies to my mom who is recovering from surgery. She declared them the best peanut butter cookie that she has ever tasted. I have to agree. The concept of peanut butter cookie has been forever elevated. I doubt I’ll ever want a plain one again! Great comparison, Anna! I know exactly what you mean about some people preferring the texture of tube dough over scratch, too. Anyway, I might have to try out a couple homemade versions of other Bake Off recipes in the next few weeks after this success. katrina…can you direct me to your blog? I would love to see the picture.